Bill L. and Tony reported in their progress towards the monument. Bill was contacted by Ron Dale, who is eager to facilitate our project. To put up a cairn would take a full archaeological investigation. This would be very expensive. However, there is a spot at the intersection of two paths between Butlers Barracks and the Gunshed where a marker could be located. This is on a former roadway where no archaeological survey needs to be undertaken. Parks Canada is planning an historical display concerning the past uses of the Fort grounds. It will be at Butlers Barracks which is the home of the museum. WJ'55 would be part of that historical display. If the monument is within the limits of the former roadway, Parks Canada will support the placement of a bronze lectern plaque on a steel post. They would look after the design and production so that it would fit with the standards they have. A plaque would cost about $2,500. Ted noted that the cost that he had looked into was in the same order of magnitude. The steel stand would be several hundred dollars in addition. Parks Canada may consider the stand in its budget. This could be underway and accomplished in time for the Anniversary celebration. Bill and Tony raised the question of the National Historic Sites and Monuments Board and the lack of success by both Mike Scott and Tony Roberts. Ron Dale agreed that this was a subject that fell within their guidelines. He informed them that he was acquainted with the people in charge and that he was willing to help us with the application process and he would take a personal interest in seeing that it came about. Mike Scott had approached the province. This avenue need not be abandoned yet. The town of Niagara-on-the-Lake hosted a lunch for the Governor General, Vincent Massey who was there for the opening ceremonies of the Jamboree. There might be a possibility of making something out of that from a town or provincial point of view. Bill Connor has spoken to Mike Scott. Mike had been out of town and was heading for Europe immediately. Bill Connor will speak with Mike Scott when he comes back and will ask him about official status of this event from the point of view of Scouts Canada. 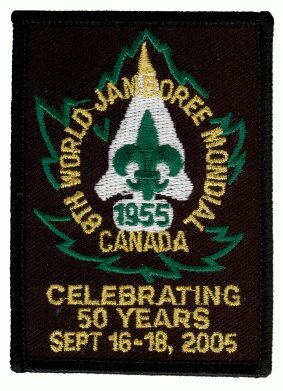 With regard to the use of the WJ'55 symbols, the committee decided to ask Scouts Canada for permission to use these on a plaque and on a badge. The Committee fully supports and will go forward with the suggestion of a lectern stand monument with bronze plaque to be placed in accordance with the site suggested by Parks Canada. The Committee will take part and will fully support going forward with the initiative to have an application to the Historic Sites and Monuments Board and that a formal request be sent forward as soon as practicable. Ted reported on the list of possible events. Tony noted that the Scouts On Stamps Society International (SOSSI) voted to become an international organization at their meeting held in conjunction with the 1955 Jamboree. They are likely to be interested in participating. VIP seating area for the SBFG parade. Formal banquet. What establishments in Niagara on the Lake or in Niagara Falls could be the venue? Invite the SOSSI, Badgers' Club, and Scout Memorabilia Club to meet during the celebration. Keynote speaker. It would be particularly good to find a prominent person from among the WJ'55 Attendees. Invite WJ'55 host families to participate. Recognition for attendees who continued their Scouting participation. Monument unveiling ceremony. Scouts Canada, local, provincial, and national dignitaries should be invited. Special invitation to the Governor General. Special invitation to the Secretary General of WOSM, Eduardo Missoni. Block booking of seats for a performance at the Shaw Festival. Bus tour to Niagara Falls. Hospitality venue with WJ 55 memorabilia and souvenir items. Perhaps the Niagara Falls Scout Shop will be back on track and could participate. Welcome by the organizing committee, reception and meet and greet for WJ'55 attendees. Shaw Matinee / Bus Tours. 18:00 Gathering; 18:45 Seating/opening remarks, WJ'55 slide show, 19:15 Dinner, 20:00 speakers and presentations. Ted and Tony reported on the progress with the Badge created by Harry Niezen. We will leave the approval until the next meeting. George Howse, who was a Scouter at the time of the Jamboree, suggested that we approach the Rotary and Lions about the possibility of funding. Ted will follow up on those groups and will get the addresses and make the request. The next task is to publicize the event. Building the contact list will be a task, this is where the work will be. The committee has had one contact already from the United Kingdom and one from the United States. It is important to get the endorsement of Scouts Canada and of the WOSM. Bill Connor will speak to Mike Scott about the formal endorsement of Scouts Canada. Bill Connor will deal with contact for Mike Scott as they have a professional relationship through the Niagara Development Board. Mike Scott had hosted the Philippine ambassador at a reception at Navy Hall. The ambassador had been a Scout at the Jamboree. This may be a good contact.